How many schools currently offer online programs aimed at the adult student? How many degrees are currently available, at what level, and in what disciplines? What trends are developing that could be useful and actionable for schools currently offering or thinking about offering online programs? Another benefit of our research is the eventual creation of an online catalog covering every online degree offered in the United States, thereby providing a deep and robust resource for potential students. This would allow all colleges and universities a medium to enable comparison and consideration of their programs by students everywhere. These trends juxtaposed upon a still weak economy, an increasing need for the adult learner to reinvent themselves several times in their lives, and growing government regulation in the space helped spark this multiyear research project designed to gather and provide data to schools and students alike. Work began by polling data provided by the Department of Education’s database (IPEDS) to assess how many schools self-reported “online” offerings. After collecting this data, we then set out to prove or disprove the self-reported facts though the arduous process of visiting every college and university website and cataloging their online programs, a task that has lasted more than 18 months and still continues. Our goal is to maintain a living database with help from the university community that accurately displays all online programs available in the United States. We also seek to maintain statistics on the growth and size of offerings in the years to come as a method for reporting key indices that schools, students, and businesses will find helpful. With the initial research phase at more than 90 percent complete, we have enough information to offer our first report and will continue to publish updates at regular intervals. The number of self-reported online schools totaled 3,311. 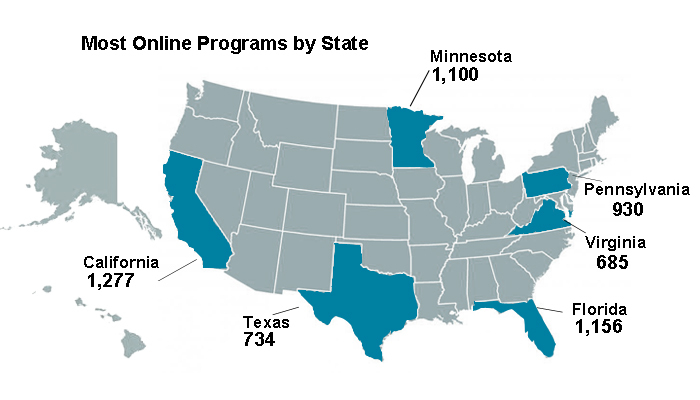 However, the actual number of schools offering online programs currently stands at 1,243. This number will increase as our research continues. There is noise in the data leading to roughly half of all postsecondary schools in the country claiming to have online programs. The information is technically correct, although somewhat misleading. The database includes every location that a school might have listed as a separate entity. The term “online” is overly ambiguous and broad. As an example, five well known for-profit colleges accounted for over 280 campuses, each reporting having online programs. For the purposes of our report, we roll up multiple locations of the same university under the school’s main “online” college. Many colleges self-indicated “online” offerings, but we found this to be too general of a term. Many colleges indeed offer non-credit courses online through their extended learning departments directly, or through partnerships with organizations such as Cengage’s Ed2Go. By filtering out all online courses and focusing only on diplomas, certificates, and degrees, we eliminated many colleges, primarily at the community college level. In some cases we found that schools self-indicated “online” to mean that a small number of classes in an overall campus-based program could be taken in an online format. As these degrees were not meant for the adult student and were not truly online, or what we would even classify as a hybrid, these too were removed. At present count, the number of online programs stands at 17,374, averaging 14 programs per school. The degree levels in which the programs are offered are shown below. 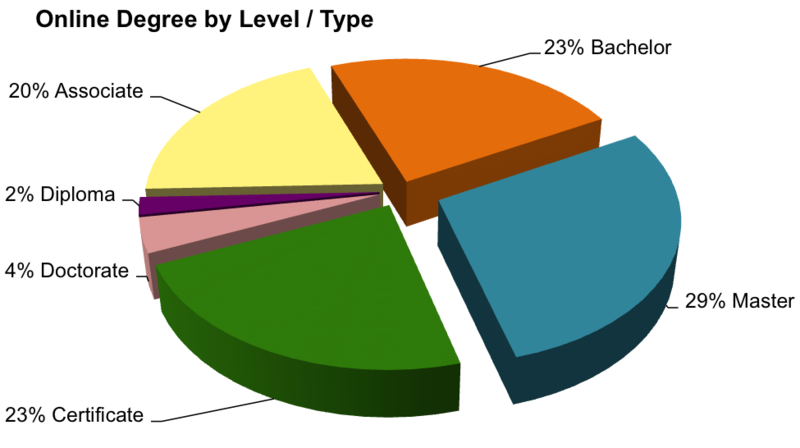 The largest represented degree level is masters, indicating a natural match of degree offering to the demographic best served by online education: the adult student. Though not indicated in the graph above, many online certificates are post baccalaureate, thus pushing the percent of programs aimed at the graduate and post graduate student to nearly 50 percent. Grouping career type diplomas (postsecondary) together with associate degrees indicates significant effort being made to appeal to the adult student who dropped out of college earlier in their lives or who did not go to college after high school. Students in this socioeconomic group, who are typically in a job they can’t leave to go back to school full time, must have an online modality to keep working while they study. This underscores of the primary advantage of online learning: the ability to better fit life, work, and education in the student’s life. Leading the way, as most would expect, is the Business and Management category. As the most broad and popular, it has nearly double the amount of programs as its closest competitor: Health and Medicine. While we felt the Business category would lead the offerings, the amount of media coverage seen for nursing, criminal justice, and technology programs gives the appearance to the casual observer that these categories would be closer to the business programs than they were. Over the last few decades, due to information indicating the growth potential of the health care industry and the graying of our population, many schools had health program offerings in a traditional format. The migration to the online format is understandable and began very early in the 2000s. It shouldn’t surprise anyone that Health and Medicine is holding down the second place spot in the rankings. It is interesting to note that Science and Math programs are the lowest of the traditional categories (excluding Votech and Career Development). This appears to be a natural reflection of the United States migration away from science, technology, engineering, and mathematics (STEM) over the last 35 years. Perhaps with the current focus on STEM at the secondary level we will see a higher percent of programs offered in this area by the 2030s. 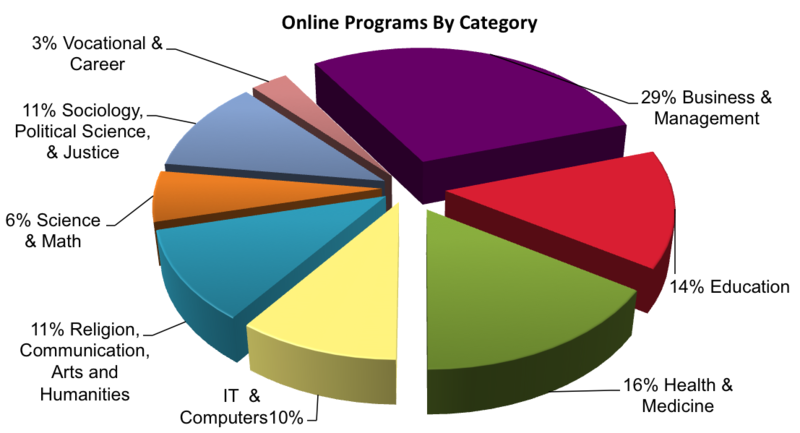 We grouped the data to look at the number of schools with online programs. 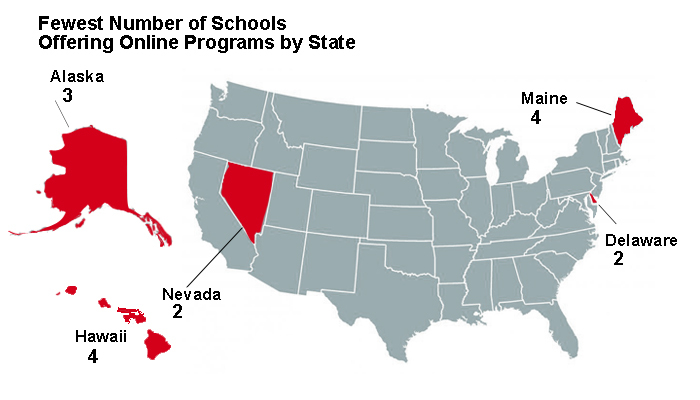 Next, we examined the number of offering schools by state. For this report, we have included the top and bottom states in each area. Readers will notice two states in the top six that may be surprising at first glance: Minnesota and Virginia. Minnesota’s high ranking benefits from having two powerhouses in online education, Walden University and Capella University, based in the state. Walden University is notable as the largest online school by program count in our research, given that it has a large variety of programs and significant specializations possible in many programs. Each specialization has a separate description on their website so these were included as individual programs consistent with the method used in our research. Virginia ranks in the number six position due in large part to forward thinking and innovative Liberty University, a non-profit school that is one of the leading online universities in the country (non-profit or otherwise) in number of degrees offered and students enrolled. Noticeably absent are New York and New Jersey in online degrees offered, indicating there are factors at play outside of population. However, California, Florida, and Texas show that often population does factor into the equation. Perhaps the least surprising data represented is that the number of schools offering online programs by state and essentially mirrors the top states in general population. While Illinois didn’t make the top five, it’s not surprising to see Pennsylvania. One would expect a higher number of schools to support these populations; the research proved this is the case. The states with the lowest number of online programs offered are not as surprising as they tend to be some of the smaller states geographically and generally have a smaller amount of schools within their borders. Nevada, having grown tremendously over the last 25 years in population, is an interesting case. Traditionally, schools follow populations with a certain lag time, and we see Nevada has surged in population, but the number of schools to support that growth is only starting to catch up. It is also important to realize that with close proximity to California and Arizona, both higher on the list, many of Nevada’s residents likely enroll in programs offered by institutions in those states. Approved Colleges Founder and President Tony Huffman is a 13 year veteran of the online education industry. Huffman was the first employee at eLearners.com. During his 10 years with the organization, where he led the sales and account management efforts of the company early on, he interfaced with online universities throughout the nation. Later, he spearheaded the development and launch of Test Drive College, a revolutionary program designed to allow students to take a free, transferrable, for-credit course prior to enrollment at an online university. Upon his departure, he consulted with online universities to help them better understand all facets of the marketplace. In 2012 he started Approved Colleges LLC, which provides robust information for potential students, compiles industry information, and offers businesses a way to better train, assess, and educate their workforce through http://business.approvedcolleges.com.